What we now know of as track (and field) was probably invented by the Greeks a long, long time ago. At first, it was a simple affair, with basically only one event; the 200. Since track began as an amateur sport, this distance was no doubt determined by the simple concept that then, as now, 200 steps (meters) is about as far as you can race, all-out, without actually training. The earliest known track was located at ancient Olympia, in Greece. It was not an oval, but a rectangle. Archeologists have determined that it was 212.54 meters long and 28.5 meters wide. At one end was the finish line, at the other a series of posts through which a rope-and-gate contraption prevented “false starts.” Of course, today we place greater trust in an athlete’s integrity…but standing by--just in case--is a guy with a gun. In time, other events were added to the competition, such as the javelin (man’s version being far less electrifying than that of Zeus), discus, jumping (or leaping), and boxing/wrestling. When combined with a footrace, these five events comprise the ancient pentathlon. Eventually, the addition of two-and four-horse chariot races, which raced distances of from two to eight miles, were accommodated in a second, longish-oval facility, called a hippodrome. Of course, now that the big guys were in town, they too wanted to compete in “the games,” so the hoplitodromas was added to the Olympics. This event was run in armor, which was basically a helmet, shin guards, and shield…but nothing else. Did I mention that the Greeks ran au natural? Since guys were--even then--guys, wives weren’t allowed to watch the Olympics. It is an historical footnote that one woman, Callipateira, disguised as her son’s (male) coach, snuck in to witness her son Peisirodos’ victory in the boxing competition. However, in celebration of his success, her rather non-masculine response—or perhaps it was her soprano voice—“exposed” her gender. Since they didn’t toss her off the cliffs of Mt. Typaion (the penalty in those days for non-males being caught in “reserved” seating), she must have had a rather convincing alibi. However, women were women then too, and after the passage of “Title XVI”, Greek women created the Heraea (or Heraean) Games, a separate but equal—well, 5/6 equal in distance, lest they show up the men—competition. Of course, the guys made all the rules, so they were allowed to watch. (Why is it that guys always get their way?) Plus the women had to be unmarried (read: virgins), mostly clothed, and competed in three age categories (children, adolescents, and young women). · The “pizza hut relay”; four athletes, each with their own leg, sprint across the track while eating a slice of pizza. 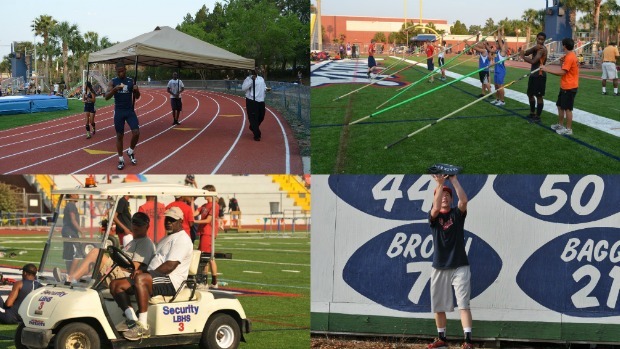 · The 100 meter “pole-sprint”; as many athletes as can fit in the end zone sprint 100 meters and vault the goal in the opposite end zone. First one to land (alive) wins. · The modern chariot steeple (for coaches only); two men in a golf cart weave their way completely around the infield, swerving through the crowd, pass under the water hazard, and finally enter the green shed at the start/finish line. As the first one goes through, the doors close automatically, “sealing” the victory. · The two-man baseball throw (inspired by the wooden fences on the first turn). One guy-the thrower—hurls a ball as far as he can, trying to clear the fence. The other—the catcher—retrieves the balls that don’t quite make it over. After three throws, the one with the most home runs wins the derby. · The water guy added an eleventh hurdle—a water cart—to the outside lane. (He thought he had time to “top off his tank.”) No doubt this water “hazard” will eventually become a final “hurdle” for those who have found their event too easy. These latter suggestions, of course, are made purely in jest…although the photos show that they did, indeed, occur. Once this meet began in earnest, however, there was little room for frivolity…well, maybe just a little room, depending upon who was looking through the camera lens. Don’t worry, there were only two. On Wednesday, April 11th, meet organizers held the field events (preliminaries and finals), and the sprint preliminaries. When things started moving too smoothly, it was decided to wait until the field events concluded before starting the running events. This still allowed enough time for everything to finish by about 9:00 PM—including my camera’s ability to take decent photos--except the Boys’ pole vault, which may still be going on. Actually, take that back. The results sheet shows that Chris Tiedge, of Hagerty, in a final successful attempt, hurled himself into the darkness, and cleared 11’6”. The shot and discus competition were staged in the “outback,” so-called because of their proximity to a branch of that well-know restaurant chain of the same name, and the suggestive aroma of broiled steak and “Bloomin’ Onions,” which wafted across the landing area. With those fried onions barely beyond Nathan Milch’s winning 161’6” discuss throw, athletes and sportswriters alike could almost taste those 3000 calories and 134 grams of fat whenever the wind blew the right way. Who could think of a better snack just before (or after) competition in the weight events…or perhaps while conducting interviews? Nathan, though only a junior, is currently near the top of both the shot (10th) and discus (12th) lists in the state of Florida. What’s amazing is that he’s only just getting started. 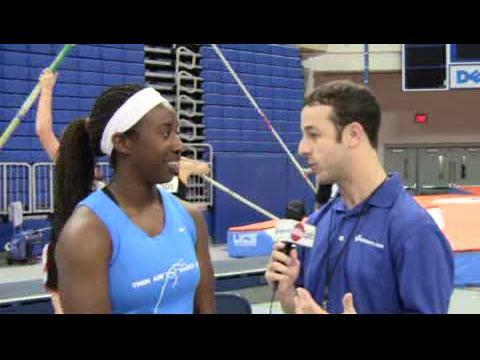 In college, Levin moved over to the weight throw (55’ ¼”) and the hammer (169’5”). Meanwhile, Milch had a double win in this conference meet--Nathan tossed the ball 50’ 2”—adding his sixth SAC title (two Freshman/Sophomore, and four open titles) in less than two years. One might wonder whether, in the midst of all his success, there are times when one event plays favorite to the other. “They both kind of advanced the same amount until this year. I got a big PR in the shot. 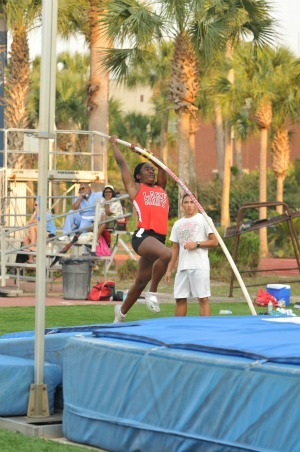 I threw a 51’6” at the Bob Hayes Relays (March 17, 2012). Despite having thrown these former Greek weapons for less than two years, Milch is already a convert. “I play football—outside line backer—and basketball—shooting guard—because I like to. It’s fun. But I couldn’t see myself playing in college. I view myself as a track athlete, now more than ever. Nathan is quick to point out that he has not gotten where he is without help. And of course, there is his inspiration for attempting the event(s) in the first place, David Levin. With his current rankings, and still having the best part of two years to improve, Nathan’s meteoric rise to prominence might be a premonition of even greater accomplishments to come. That might also come to pass in the case of the Girls’ double winner, Rebecca Evans. She, too, is only a junior. 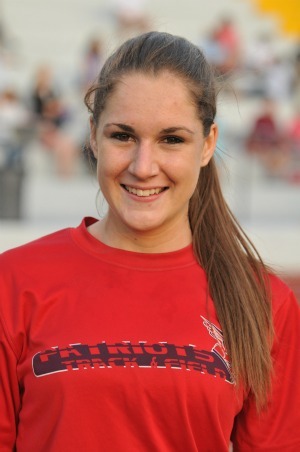 Currently, her best discus throw is 129’ (May 28, 2011 at the Golden South Invitational). In this meet she hit 126’ 3” in the discus (currently 14th best in Florida), and 35’ 6-1/2” in the shot put, winning both. While I was missing the shot and discus—I actually had my discus-sion with Nathan before Day 2’s events—the rest of the field events were going on in the bright sunshine of Tom Storey Field. With the competition being—while we’re in to ancient languages—ferus (fierce), there were no more double winners. However, worth noting, among the winners’ notable performances were Erica Sergeant’s 12’ 1-1/2” conference record in the pole vault; freshman Mikaela Martin’s two PRs (a winning 17’7” in the long jump, and second at 4’10” in the high jump), and freshman Raheen Powell’s win in the triple jump (42’5”). 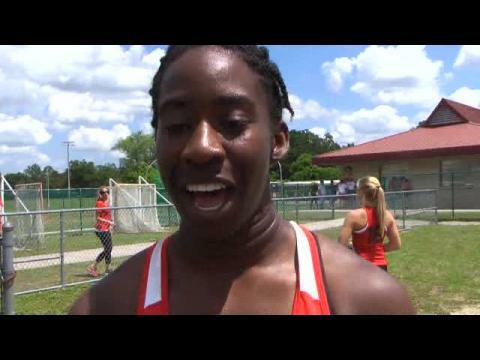 Lake Mary sophomore Erica Sergeant came into the meet with a 12’ 7” personal best (set at the March 16th, 2012 Deltona Invitational), and a 13 meet winning streak. The last time she didn’t come out on top was at the May 28, 2011, Golden South Invitational, way back when she was a freshman. 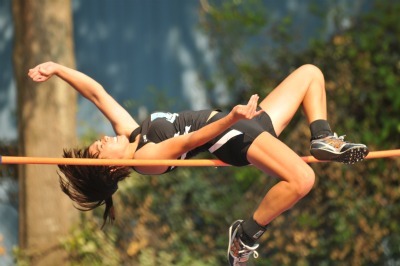 (In that meet, senior Lindsey Enders jumped 12’6”, and Sergeant’s 12’ was second.) So it comes as no surprise that, in this meet, after setting the conference pole vault record and winning her fourth SAC title (two Freshman/Sophomore and two open), she would go on. But 12’8”? 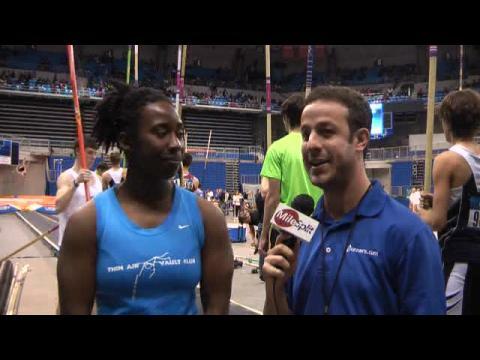 “We’ve got the meet record, now we’re going for a personal record; 12’8,” explained her pole vault coach, Bill Cashman. All three of her jumps at that final height were unsuccessful, but you can’t help but think that her setback is only temporary. “I was close to making it. My top phase—getting over the bar—was the problem. I was either in front of it, or landing on top of it…or it was not staying close enough to the pole. I was shooting straight out, instead of straight up. That statement could certainly be expanded to the aforementioned freshmen, Sanford Seminole’s Raheem Powell and Lake Mary’s Mikaela Martin. Powell dominated the previous SAC Freshman/Sophomore Meet, winning the 110 hurdles (a 16.07 PR), the 300 hurdles (a 42.02 PR), the long jump (a 21’4” PR), and the triple jump (43’2”). However, with three and a half years to go, his journey is just beginning. This time, against the best in all grades, he was one for four. The sole victory, however, came in what is arguably his most technical event, the triple jump. And yet, this is his first year in that event. And what does a 21st century athlete do when faced with such a dilemma? At that point, Brauman began putting some finishing touches on Raheem’s You-jumps. So I asked the obvious. “What’s that?” he asked innocently. “Yeah, I’d like that!” he said. If Powell has a kindred spirit, it might be Lake Mary’s Mikaela Martin, who just turned 15. Mikaela picked up the conversation. 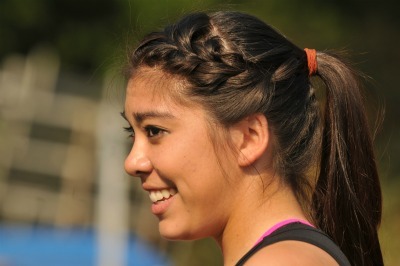 Between the two hurdle events, Mikaela has no clear favorite. And being a former distance runner, I asked the budding “expert” the difference in strategy between the two. Although Mikaela won both hurdle events at the SAC F/S meet (15.42 in the 100 and 46.74 in the 300), plus the long jump (17’4”), the “older competition” trimmed that down to first in the long jump (a 17’7” personal best) and the 100 hurdles (15.92), and second in the 300 hurdles (47.05) and high jump (4’10”). Winning that high jump was Mackenzie Geigher of Hagerty. Geiger’s “pre-jump stretch” is as entertaining as her high jump…well, maybe more so. But she doesn’t just jump “up”. After winning that event (in 5’0”, a PR), she went over to the long jump, where she traded places with Martin (Geiger was second with a 15’6” distance), then on to the triple jump (finishing fourth with 33’ 11-1/4”, a tad off her 34’ 4-1/2” best (at the March 10, 2012 Spruce Creek Invitational). 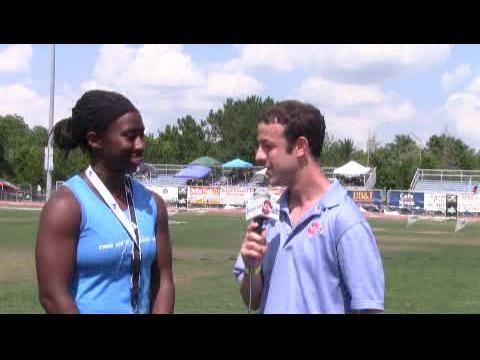 Taylor Long (Lake Brantley) won the triple jump with a 34’ 1-1/4” effort, her second SAC TJ title (34’ 2-3/4” won on April 13, 2011). But how does such a busy athlete sort them out? When asked about colleges, the UF-bound senior was even ready with her major. Another senior jumper with definite plans for his future is Lake Brantley’s Donavon Franks. Makes sense, since his track numbers are already excellent: in this meet, he was first in the long jump (21’6”), second in the triple jump (41’ 5-1/4”), first in the 200 (22.78), and anchor in Lake Brantley’s first place 4 X 4 (3:21.57). Coming in to the meet with bests of 22’ 2” in the long jump (March 30th at the Holy Trinity Elite Classic), and 44’ ½” in the triple jump (the 4A District 2 meet last April 30th), his jumps in this meet might seem uninspired; however, there was good reason. Despite that heavy load, that 200 was a solid personal best, but his 400 might have been the best effort of the day, as his anchor figured prominently in Lake Brantley’s 12 second margin of victory. Clinton Christ, by contrast, had a “short” day. 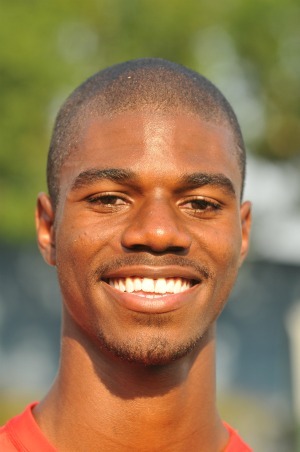 “I’ve done the 400 (58.34 personal best on March 28, 2012), 4 X 1, and long jump (19’3” at the February 9, 2012 Lake Brantley Developmental Meet), but in this meet, just the high jump,” he said. 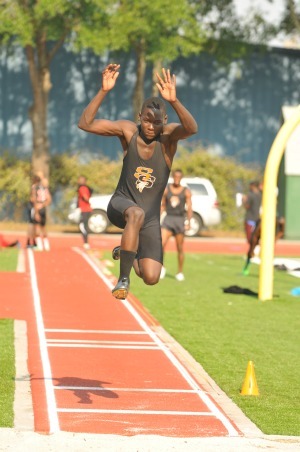 Clinton came in with a personal best of 6’6”, at the March 25, 2011 Deltona Invitational, but won here with 6’4”. 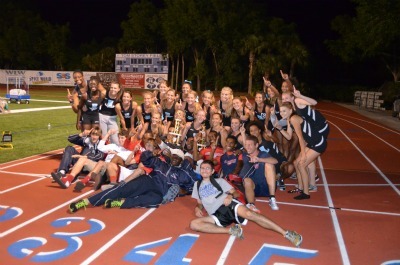 Lake Brantley’s track created a different challenge for Christ. But his best proved to be an ideal height for winning. With field events behind them, a night’s rest, and a late start (6:30 PM or so), the competition was lined up for a good night. On the other hand, with no preliminaries, the races were packed in pretty tightly, and those competitors who were running doubles—especially in the distance races—would have less time to recover between races. Considering who was running, however, it hardly mattered. 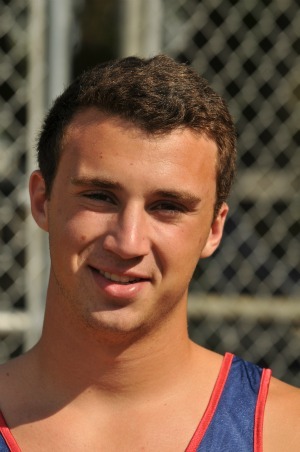 First, there was Lake Brantley’s Otneil Teixeira, quite possibly the best 800 meter runner in the state. After winning that in 1:55.40—and jogging almost nonstop around the track—he won the 1600 in 4:16.99. Likewise, Hagerty’s Amy Ankli won her two—not to mention being part of the 4 X 8—the 1600 and the 3200 (5:16.69 and 11:30.93, respectively). Winning all by a bunch, I asked if it gave her time to think ahead. Like wearing identically colored blue hair ribbons? 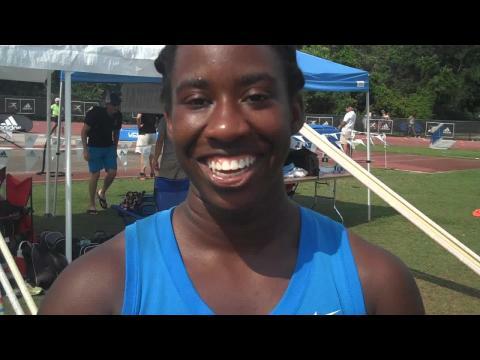 Danielle Turk, a junior at Oviedo, had two things to celebrate after her victory in the Girls’ 800. First was her conference championship, then the fact that she might just be one week closer to having three Turks on the Lions' pride. During the meet she introduced me to her sister, Marissa (2:44.49 in the 800)—“it was her first official meet in the 800,” she said—then mentioned younger-still Logan. “My brother, Logan, will be a freshman next year, but he plays lacrosse. If he joins track, we can be the ‘Turk Triangle,’” she said, forming one with the fingers of two hands. “I just like being that it’s just me out there,” she said. “I don’t depend upon the team. Whatever I do, it counts in the results. Even in a big meet, I go into it as a meet, and just a meet. Whatever will happen, happens. For now, that is being a two-time conference 800 meter champion (2:18. 83 in 2011 and 2:19.03 in 2012), with a personal best about a second faster (2:18.19 at the May 6, 2011 3A FHSAA State Finals). Unlike the aforementioned trio—Teixeira, Ankley, and Turk, who relish their roles as front runners—Hagerty’s Peter Licari runs a different kind of distance race. He uses a “wait and pounce” strategy. In fact, he has gone so far as to don a “disguise” in order to keep his competition guessing. Right behind you, me bucko. In that 3200 race were a number of talented runners, most of whom lacked experience against Licari’s well-honed tactics. First of all there was Hunter Morgan, who, although a senior, is in his first year of track. He came in with a 10:06.92 PR (Holy Trinity Elite Classic on March 30th), but here at SAC had just finished the 1600 in 4:31.88, a new PR. Next was Hagerty’s Hunter Menning, with an almost identical PR to Hunter #1, 10:06.17, which he posted at the Royal Invite on the same day as Morgan. Cameron McCutcheon, the SAC Freshman/Sophomore Champion (10:33.26), ran a 10:16.85 best at this year’s (March 22nd) FSU Relays. And lastly, Adam Pfeifle of Oviedo had lost to Licari the week before when both he (10:18.80) and Licari (9:47.52) set PRs at the Saints Invitational, a race that Blues Brother #3 won. 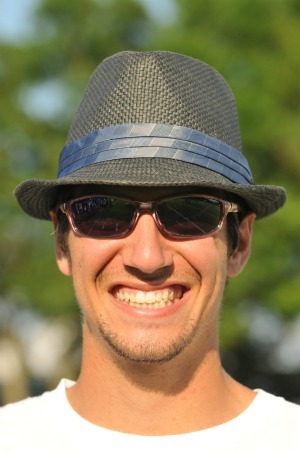 Instead, Licari created his own real-life version. Taking charge of the pace, then outkicking all of them in times far short of each runner’s potential, Licari won his first SAC Championship. 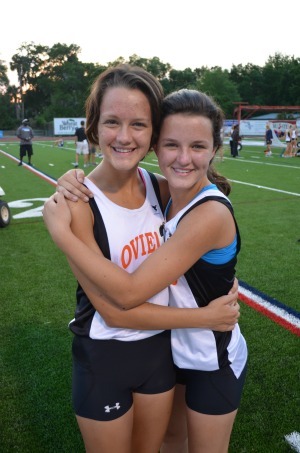 “1st in the 3200…2nd in the 1600…best conference showing ever. On my last one, too,” said the senior. Last year he did just about the same thing, winning both the 1600 (4:28.86) and the 3200 (9:58.47) against runners who came in with faster PRs. This year those races will not be for the faint-hearted. Only one athlete—DaKesha Jackson, Seminole—won two sprints; the 100 in 12.27 and the 200 in 25.53. The diaulo… I mean 400… was, like the others, a “lone win” for seniors Elana Ainsley and Kenny Lane, both of Lake Brantley. Just ask her male counterpart. Kennth—I guess that’s how it’s spelled—who won his heat in the semis in a school record (and PR) time of 49.03, then bettered that performance in the finals with a winning 48.81. About the only thing as impressive was a feat that didn’t show up in the meet records. 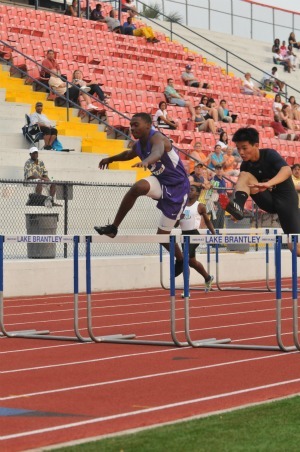 Winter Springs’ 110 hurdler, senior Kwame Knight, tripped on the ninth hurdle and went (almost, but not quite) down. With a PR five seconds slower than the eventual winner, he could have just stayed down and called it a day, but he showed the gutsiest (and most graceful) recovery I’ve ever seen. Catching himself, he stood, then in the next step easily cleared the last hurdle, beat his closest opponent, and set a new PR (20.01). It’s too bad he’s a senior. It would be great to see more of his bravado. Two athletes whose challenges may not have been as readily apparent were Antonio Johnson and Alyssa Younker. Antonio (Lake Mary), who won a rare 100-200-400 triple at the Freshman/Sophomore meet, had a lone “1” in this one (11.14 in the 100). Alyssa (Hagerty) won the 300 hurdles in 45.33, but with only one event’s rest before her next race, still managed to take second in the 200 (26.18). Lake Brantley hurdler Donovan Franks, on the other hand, seems to have sidestepped his challenges. While he runs both hurdles, his 110s are definitely his strongest. 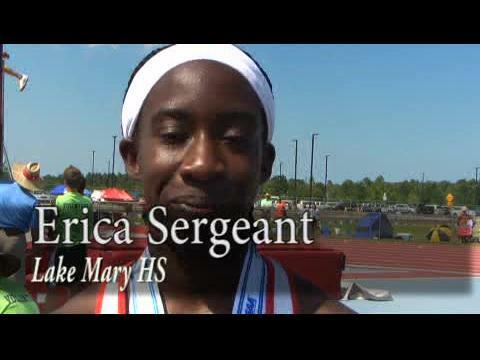 In 2011, he took a SAC second place (15.75) into the 4A District 2 Meet and won (14.67). This year, he takes a first (15.18) and hopes to repeat. In the 110/300, one of his most erstwhile competitors is teammate Dillon Morton, with whom he seems to “trade success,”…or do they? Another Lake Brantley Donavon (different spelling), Frater, is like-minded to Dillon in his strengths. In this meet, Frater—as already mentioned—won the long jump, later added the 200 (22.78), and finished with a team win in the 4 X 4, running anchor. Both the Lake Brantley Boys (210 points), and the Hagerty Girls (213 points) had nearly double their closest competitor’s score. (The Sanford Boys had 106, and the Lake Mary Girls 140.) Both winners not only scored in every event, but averaged more than 12 points per event, and that included relays. There is simply no way to stop such a display of depth…except perhaps a well-placed water tank.